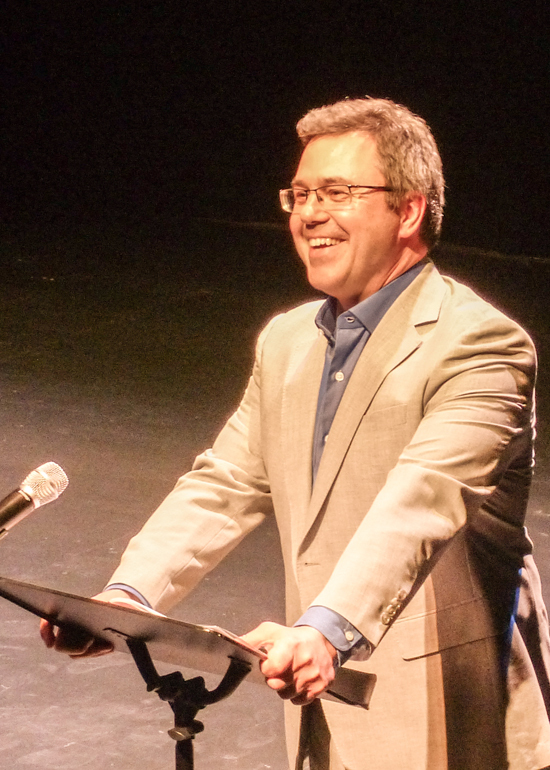 Kitchissippi’s Eric Coates, GCTC’s artistic director, at the season launch on April 8. Photo by Al Goyette. Presenting to an enthusiastic and responsive full house, Kitchissippi’s Eric Coates, GCTC’s artistic director, entertained supporters with a jam-packed hour of information, laughs, glimpses into the 2014/2015 season’s plays, and a very creative ‘subscription’ notice who periodically wandered onto the stage in his birthday suit (well, almost). GCTC celebrates its 40th anniversary in 2014/2015, and in the words of Nhanci Wright, Chair of the Board of Directors of GCTC, the theatre has “survived through the people who come to see the plays.” Originally housed on Gladstone Avenue, they received a donation of $2.5 million in 2004 to build the Irving Greenberg Theatre Centre, located in the heart of Kitchissippi on Wellington Street. Although it ultimately cost over $11 million, through funders and sponsors, volunteers, donors and Board challenges (which raised $30,000 last year), they are close to being debt free. Other changes to GCTC this season include Undercurrents moving to the Fringe Festival and being replaced with Propeller Dance, an accessible dance company that integrates individuals with disabilities. The group will be practicing on site at GCTC during the year and performing in May 2015. For more information on this new season’s plays, visit the GCTC’s website at gctc.ca.